To help remedy my vacation-is-over-blues, I am mentally extending my vacation this week…. all of my posts will be lowcountry-inspired so I can stay in that lowcountry state of mind! One of the best things we did on our vacation was take walks on the beach. Little buddy could run wild without fear of cars or scraped knees. He loved running up to all of the other children and relished his freedom! 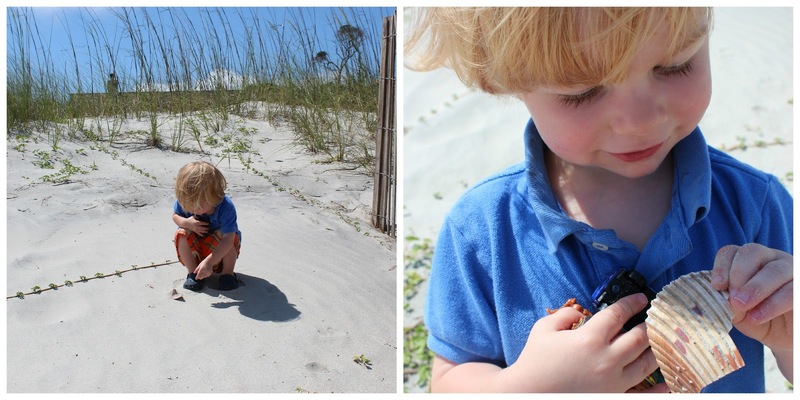 While on our walks, he would often stop and squat down to pick up shells, rocks, sticks, a deserted beach toy or whatever else caught his eye. He even found a matchbox car (of course!) and Daddy’s pockets were full of his found treasures! But he wasn’t the only one stuffing his pockets with beach loot. This momma was busy scouring the shore for driftwood! Don’t you think it is the perfect accessory for a summer mantel? And FREE! 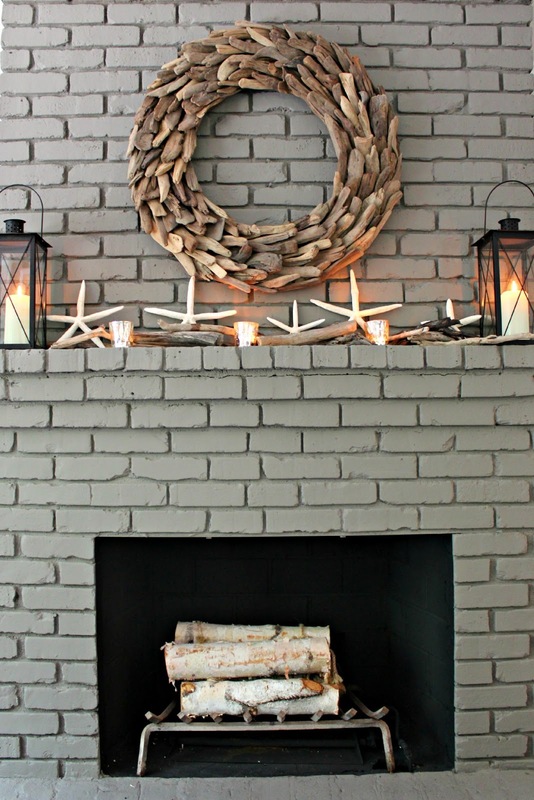 I purchased the driftwood wreath from Restoration Hardware last January. We had the fireplace painted Restoration Hardware Slate a few months later. I pulled the starfish over from the sunroom. The black lanterns were also in the sunroom purchased from World Market when we first bought our house. My sweet friend bought me the Pottery Barn mercury glass votives for my birthday. The birch logs were purchased when I played hookie one day and shopped with a girlfiriend who has access to the trade decorator shops here in Atlanta. I had our gas logs in there but figured we wouldn’t be using the fireplace this summer so put them in storage. 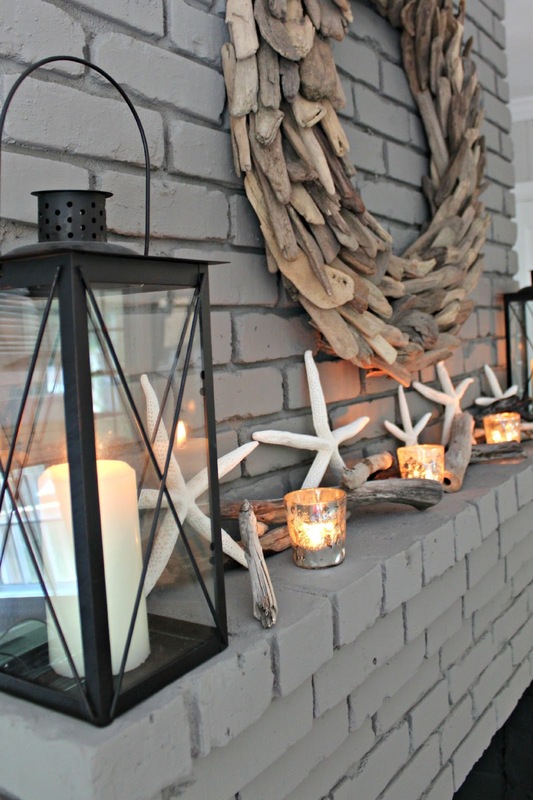 Have you updated your mantel for the summer? Beautiful, Heather! Your mantle is gorgeous. 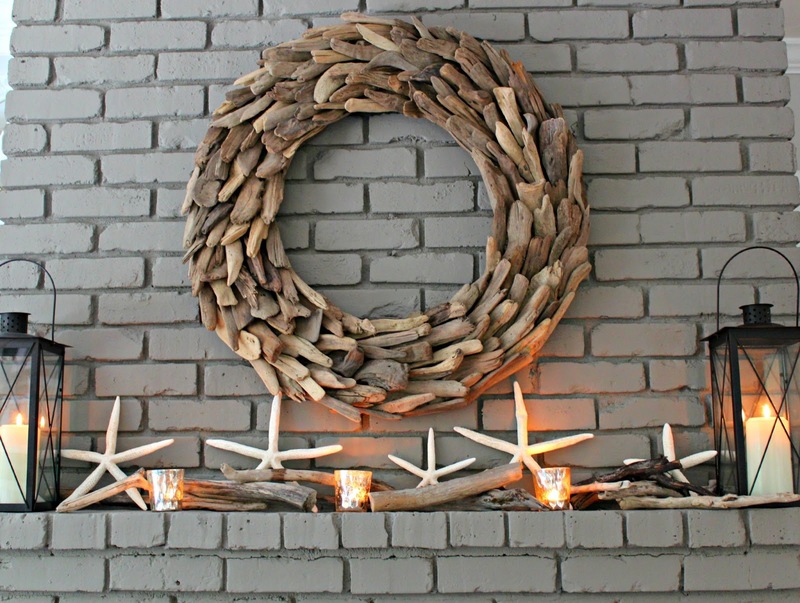 Love the driftwood wreath! Your mantle looks wonderful! Thanks! I love that the wreath can be used year round! Thanks for stopping in! This looks beautiful! Just signed up as your newest follower! Hi Katie! Welcome! Look forward to hearing more from you! Thanks so much! 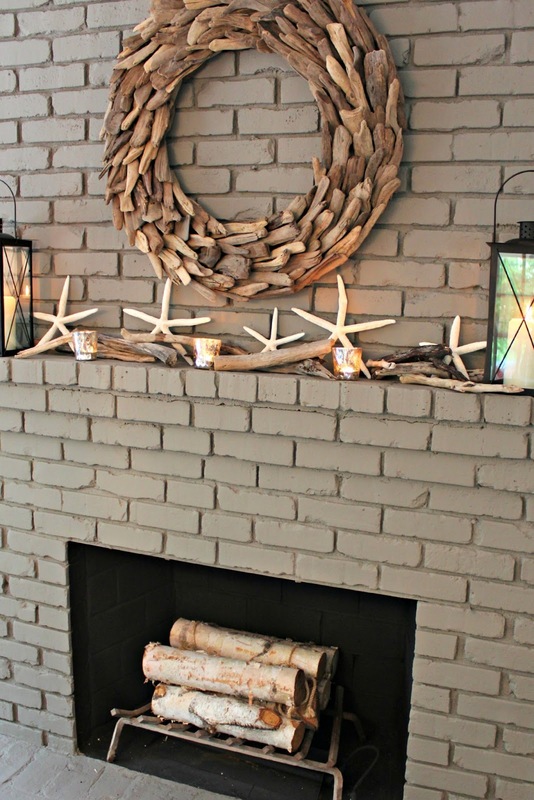 Heather, I adore the coastal look so of course I love your mantle! Your little one is such a cutie. I am a new GFC and bloglovin follower. Welcome and thanks so much for joining in on the fun! Looks awesome! So calm and relaxing to look at! I just picked up some drifwood too so thanks for the idea!! oooh! can't wait to see your creation! I am obsessing over driftwood these days! The mantel and wreath are wonderful. I looooooooooooove that wreath SO much! Your whole mantel looks great!